What do you do when your favorite board has a ding? Dings can be caused by something as simple as your knee going in your surfboard. You cannot leave a ding on your surfboard, because if you do, water can soak in. If you see a ding on your board while you are in the water, you should get out of the water as soon as you can so water does not soak into it. So, what do you do when you know your board has a ding? Our video shows the process of repairing your own board. When you learn how to repair the dings on your surfboard, you do not have to wait for your local shop to repair it. This allows you to get back to your passion much quicker. 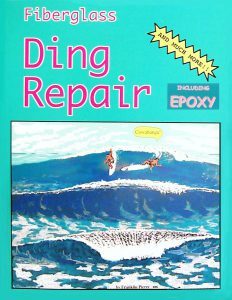 Franklin, with over 30 years of experience with surfboards, has created a step-by-step book on ding repair that is available for purchase. As you saw in the intro video, Franklin can show you how to expertly work with resins, catalysts, solvents and fiberglass products. Need to know how to work the power sander and polisher on your board? Franklin teaches you how. If you need clarification or help with your DIY ding repair you can call us at (760) 433-3600. Franklin’s instructions will show you how to work safely and teach you professional methods to save you time and money!